My goal: To make others feel the way I do when I look at paintings that move me. I need to do something away from the computer. I need to work on something that requires me to focus without the web being a mouse click away. I love making stuff, and I've always wanted to paint. This blog is here to document my journey from painting truly awful paintings to something I can hopefully be proud of. My goal is to post ~3 paintings a week and consciously learn from the mistakes I make in them. This is my painting #001. If I'm going to be honest, there was a painting #000, but it was so awful that I couldn't bare to post it. I tried to do a still life of a cup, but it was so bad that I couldn't even find humor in how awful it was. 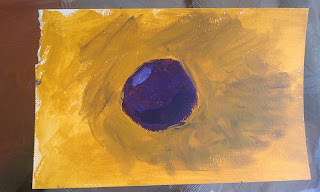 Getting time to paint is hard and I wanted to have something to show for myself, so I decided to just "paint a purple ball". This painting I found immediately hilarious. The reason why there's a bunch of darker marks around the ball is because I managed to pull some purple paint from the ball out into the "background". The result is my attempt to hide that mistake. The colors are almost straight out of the tube (Liquitex Basics). I should avoid painting from imagination for now. It's probably better to have a plan. Mixing colors with brushes is hard--my little puddles of paint disappear into the brush the more I mix. I've read several places that the best way to get better is to paint a lot and get the bad paintings out of the way. 1 down.